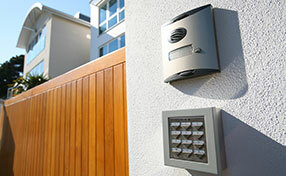 While most people today would not even take a second glance at their home's parking or driveway gate openers, these humble but truly useful devices have a very colorful history. The earliest versions of the parking garage gate were the “carriage house model”, which were made from simple materials and structures and the main purpose was to protect the motor vehicle from the elements like rain, wind and even thieves. Let's take a brief look at the history of garage gates. The earliest versions of the garage door resembled like “barn doors”, wherein they were attached to the garage by strap hinges, which opened outwards. In the 50', 60's and 70's, the garage doors resembled a basic shed as the doors were opened and closed every day and were subject to constant wear and tear. The vintage garage doors also had hinges that eerily creek, the screws would often get bent and fall out eventually. And if it was snowing outside, the resulting snowfall will most often block the garage door's path, making it extremely tough to open the gates without shoveling the accumulated snow first. 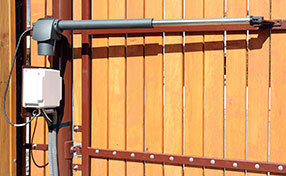 The invention of the sliding tracks for the garage doors made opening and closing of garage gates more convenient. The door's sliding tracks ate up less space, and thus allowed the door to me moved sideways or across the front of the garage. However, the invention of sliding tracks also meant the home's garage also had to be at least “double” the width of the floor. Hence, the next versions of garage gates or doors were cut into sections and they too were hinged together at the intervals, so that they could be folded around a corner. Most people often mistakenly think that overhead or roll-up gates were invented in the 70's or 80's. The truth is that they were actually invented in 1921 by a guy named CG Johnson. The earliest version of the overhead gate or door could easily be lifted upwards and folded parallel to the garage ceiling. And five years later, CG Johnson invented the automated door opener for those who have difficulty lifting the heavy wooden doors. Today, overhead garage and parking doors or gates remain a truly popular choice among homeowners and business establishments. 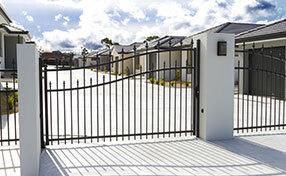 One of the leading overhead parking gates or garage door manufacturers is Wayne-Dalton. In 1956, the company hired Amish craftsmen in the Mt. Hope, Ohio area to design and manually build garage doors or gates. Today, the company takes pride in their move to hire Amish furniture designers and they have continued the tradition of churning out high-quality and high-tech, multicode remote garage door openers, tamper-proof bottom brackets and pinch-resistant doors, which are made from materials like aluminum, galvanized steel and polyvinyl chloride.